Hi folks: Newbie here, hoping to get a little feedback on my first typeface. Just to briefly introduce myself: I'm a graphic designer (my day job is in publication design) who's always been interested in type design, but I'm only now getting serious about it. I've been drawing letters most of my life and do some lettering here and there, so I'm no stranger to constructing characters and words — but I'm basically teaching myself the technical side of how to make typefaces, through trial and error and a lot of reading. I'm at a point where I could use some outside eyes on what I'm up to! Anyway, the basic idea with this was a typeface with no curves, but in no way college-y or sports-y — so it's got some contrast and some asymmetry. Definitely a display face. I'm pretty happy with where it's going. Cf. Klang; ITC Machine; London Olympics typeface (note the o). Machine is a perfect example of what I was trying to stay away from: that's what I mean by "college-y/sports-y"... all based on symmetrical octagons. My thought was, can I do something with all straight lines that is not that? Always thought it a little weird that the London typeface's O was a perfect circle and the only round character. A reference to the Olympic rings? I think your doing a good job avoiding the college-y/sports-y flavors, and your typeface is interesting. The contrast is not very consistent,. While it's clear among the horizontal-vertical lines it get lost on the diagonals specially in the /K/M/V/W/X. I think that applying the classic rule of left diagons - thick, right diagons - thin (exception Z) might harmonize things a bit. I'm not feeling too comfortable with all the diagonal endings/finals/tips, there are too much on the same direction (as in the /N). The /A for example feels more "stable" since it's left leg is chopped with the baseline. The /M looks like it is distorted and influence the "stability" of the line. The /G's right bottom is "stabbing", maybe consider chopping it's tip. 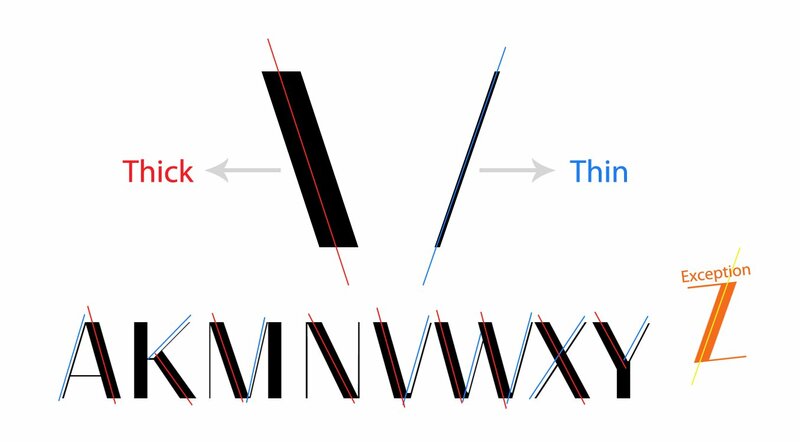 Spacing - /C/E/G's right bearing can be reduced a little, it's not the distance between the characters that matters but the black and white balance, or as @Frode Bo Helland said: "The amount of white inside and between letters should be optically equal." and since these letters are open on the right it should be compensated by a smaller bearing. Maybe the spacing of the /H and /o (as reference to all straights and octagons) should be checked accordingly as well, they might not need to share the same spacing. I agree with Ofir above for the most part. In particular M leans a bit to the left, due at least partially to the angled terminals. Z also leans, though to the right. Overall the design seems solid. A few more suggestions. The counters of the ampersand are quite small as is the upper B counter. Also, do the numerals, containing more angles, appear more refined than the latin glyphs? With regard to spacing, the round characters, which normally have reduced sidebearings, are in this type flat-sided. They do probably require some optical correction just less than is typical. Finally, where strokes converge, as in K, they may be slimmed to decrease the darkness of the join. Congrats on putting this together, Austin. Wes, I made the numerals that way to differentiate them a bit — At first 5 was looking too much like S, 2 too much like Z, etc. Re: spacing the "round" characters, you're saying they currently look a little too tight? Their sidebearings are currently a bit less than fully straight-sided characters, but you're saying I've reduced them more than necessary? Anyone have a preference on the two different versions of the round characters? You won’t get far looking at alphabets. You need to set some headlines or wordmarks. AWKWARD words like LAWYERS, HILLTOP, ALWAYS and SWIMMINGLY. Hi Austin, You might find Algo FY (http://shop.fontyou.com/shop/family/Algo_FY/) an interesting source of inspiration. Very cool, thanks Steve. I'm liking the sense of playfulness Algo has. What a crazy /W that is! I see no one here has talked about blackletter. A more obvious antecedent? Hi folks: I've tweaked a bunch of things, mostly fairly subtle. Bowing out the M made a big difference I think. Also, even though I'd conceived this as an all-caps face, I decided to draw a lowercase just to see what happened... and I like it! So now I'm wondering, does this deserve an italic? Any feedback appreciated. (Kerning isn't finished on the caps; lowercase is not kerned at all yet.) Thanks! I don't know about the italic but I would make a thin and an extra bold. Also, if interpolating, use a medium weight to balance the stems. I think interpolating would really be simple because of the lack of curves. If you continue the more-pointy version, I reccomend maybe sharpening the top of /A and /M and the top of N and do the same for bottoms on /M /N /V /W. If not, I would like a stylistic set. Simplifying the left of /6 and the like would be welcome, too. One more thing — I think this would range in the medium(-ish) weight. More like bold, if you will, so cross of the medium interpolation weight. For some reason it's hard for me to imagine this as a family with several weights (Georg, I'd be interested to hear your reasoning for a thin & extra bold but no italics!). Maybe because its "chunkiness" seems like such an important part of its personality. I can barely visualize what a thin version would look like! Only one way to find out, I suppose. To make your life easier, how about using another either thinner or bolder weight and start by extrapolating. Not the best but it works. I'm not sure I understand what you mean — you're saying to extrapolate versions thinner or bolder than I really want and then use those to interpolate? I think he means create just one extreme weight to start, then use that plus the weight you have to extrapolate the other extreme as a starting point to its design. Ah, I see. I'm new to extrapolating/interpolating. I'll probably give it a shot even if I don't end up using additional weights, just to use this as an opportunity to learn. Craig, I don't know if you noticed, but I've been using a few of your pangrams as test text! I didn't mean to use interpolation. You might need a few more lines to draw a nice Light. I just thought it might be more useful to have contrast like that. I’m realizing I created a pretty difficult challenge for myself for my first typeface. Figuring out how to handle the overshoots on these asymmetrical “round” characters is rough!